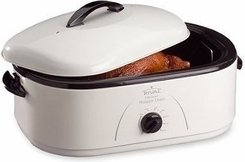 Now you can get oven-roasted goodness on your countertop with this roaster oven. It does everything: roasts, bakes, and serves. Featuring a large-capacity surface that can hold an 18-lb. turkey and a removable roasting pan for easy cleanup. Plus, it comes with a handy buffet server that warms up to three different foods at once.